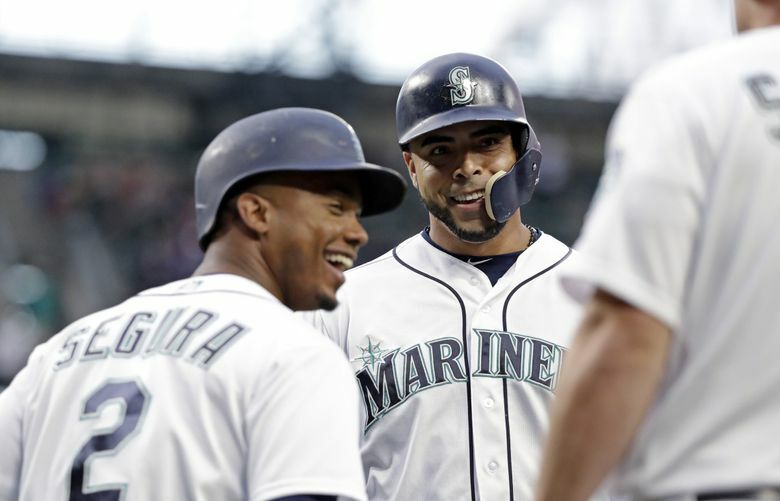 With 10 games to go until Nelson Cruz's contract expires with the Mariners, the club has yet to approach the slugging DH with a contract extension. "Players move on. I would love to stay here. But it’s part of the business," Cruz says. HOUSTON — It’s a subject that Nelson Cruz tries to avoid thinking about, so getting him to talk about his future and his possible pending free agency isn’t something he particularly enjoys. Always affable and good-natured, he doesn’t get angry when asked about it. But this seems to be the equivalent of interrupting in the midst of one his daily pregame power naps. With 10 games left in the season, has he thought about his future and will it be with the Mariners? Mailbag: Answering all things Nelson Cruz, including a possible future in ... Houston? Even his agent Bryce Dixon, who started representing Cruz in December, has grown to understand that this can’t be a subject discussed often or at great length right now. Dixon drove up from San Diego to Anaheim last weekend to check on Cruz. And the topic of free agency and Cruz’s future still had to be briefly mentioned. Dixon also mentioned Cruz’s preference to return. Cruz’s four years in the organization have been unbelievably productive. Signed to a four-year, $57 million contract before the 2015 season, he has proven to be one of the best free agent signings in team history. He’s averaged 149 games played in those four seasons with 40 homers and 102 RBIs. Per Baseball Reference, he’s totaled 17.1 Wins Above Replacement despite being punished in the metric as a designated hitter. At age 38, he’s hitting .262 with an .872 on-base plus slugging, 17 doubles, a triple 36 homers and 90 RBIs in 134 games. He’s been beyond productive on the field in his time with the Mariners. Off the field, he’s taken a larger leadership role within the clubhouse as well as being a standout member in the community. His teammates love him and his manager and coaches use him as the perfect of example of how a professional and teammate should act on a daily basis. “He’s an agent’s dream in a lot of ways,” Dixon joked. And yet, the Mariners have not approached Cruz about a contract extension. Members of the Mariners upper management and ownership discussed the possibility of signing Cruz to a David Ortiz-like contract extension of a one-year contract at whatever the MLB qualifying offer is set at with an easily attainable vesting option for the same amount the following season. But that offer was never brought to Dixon. It’s instructive to note that Cruz changed agents in December, signing with Dixon and Primo Sports Group and leaving Diego Bentz and Relativity Sports. Bentz was the agent for Ortiz that helped negotiate those deals with the Red Sox. Dixon was not approached by the Mariners in spring training about that sort of possible extension. No discussions have been initiated by the Mariners during the season either with Dixon. “No one has talked to me about it,” Cruz said. An Ortiz-type deal seems less-than-likely. Dixon isn’t Bentz and probably won’t settle for that. Cruz’s ties to Seattle aren’t quite as similar as Ortiz’s with Boston. Cruz has an attachment to Seattle, but he also knows that can be one-sided in the negotiating process. Dixon would be wise to push for a two-year deal, even with Cruz at age 38. He’s still productive. “His performance has showed that he’s able to mitigate the decline from getting older,” Dixon said. It’s hard to know exactly what the market for Cruz would be going into the offseason. Because he’s limited to being a designated hitter, it leaves 15 AL teams. And not all of them are in the position to bring on a full-time DH. But he could be a great finishing piece for a good team in need of a power boost. He would have to want an increase of the $14 million per year he’s received from the Mariners. “I think I see more fits for a middle-of-the-order power hitter for these teams than you might,” Dixon said with a chuckle. Because Cruz was already given a qualifying offers by the Rangers and Orioles, both of which he refused, the Mariners can’t lessen his market by attaching a qualifying offer to him again. Dipoto and Dixon will have a negotiating window of about a month after the season ends. Cruz doesn’t officially become a free agent and hit the open market until the World Series concludes in November. Until then, he’ll finish the season, take a rest and begin his offseason conditioning, which will include yoga for added flexibility. Cruz dealt with the uncertainty of free agency after he declined the qualifying offer from the Rangers. He waited most of the offseason before signing late with the Orioles on a one-year prove-it deal in 2014. He didn’t have quite the anxiety after that season with multiple teams vying for his services before signing with Seattle. But that didn’t make it any easier. He prefers routine and stability. Getting something done with the Mariners and going into the offseason knowing where exactly he’s going to be is favorable. And if it can’t get done?